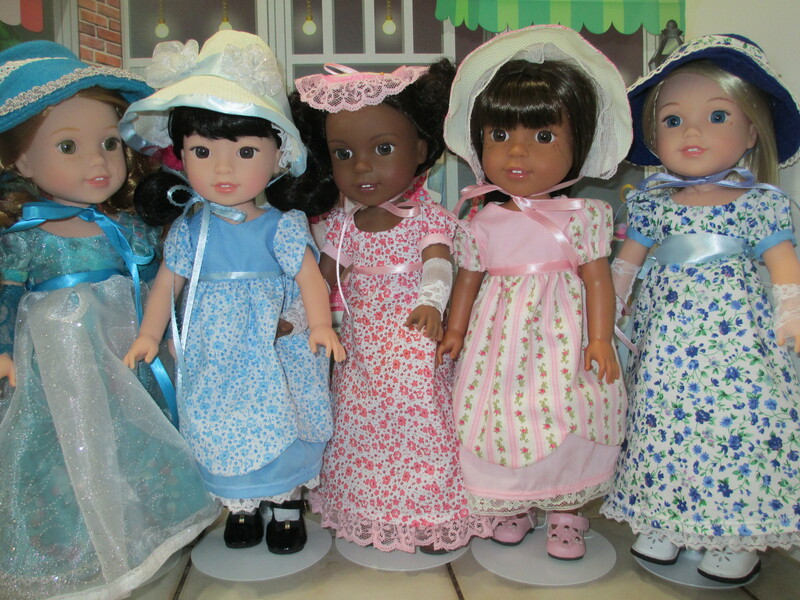 This PDF sewing pattern will help to make a very special outfit to fit 14.5" dolls such as WellieWishers™ and similarly sized dolls. You can either make an evening gown featuring a sheer overlay or a simple but lovely day dress complete with bonnet, gloves and stockings. This PDF sewing pattern is designed to fit 14.5" dolls such as WellieWishers™. • 10” x 10” stretch fabric for the stockings. • 1/3 yard lace for the overlay and gloves. • Artificial flowers or pearls to decorate the bonnet. It looks like a good pattern, I like the overall design and can't wait to dress my little doll in such a cute outfit. This elegant pattern is very easy to sew. It looks great. the other outfits pictured are from Luminaris pattern A Walk in the Past. another excellent pattern.